Tales from the Duck and Cherry: What are Tree Toes? There's a path that leads from the Duck and Cherry, down through the woods towards the open sea. It winds its way next to the neighboring estate with grazing sheep and horses, and as the landscape opens up at the end of the thicket the ocean can be seen in clear view. Every time I wander this way, be it during the summer or on crisp snow covered winter's days, I always exclaim how beautiful it is. Arnfinn must have heard it so many times. But there's a certain gratefulness that swells within me. 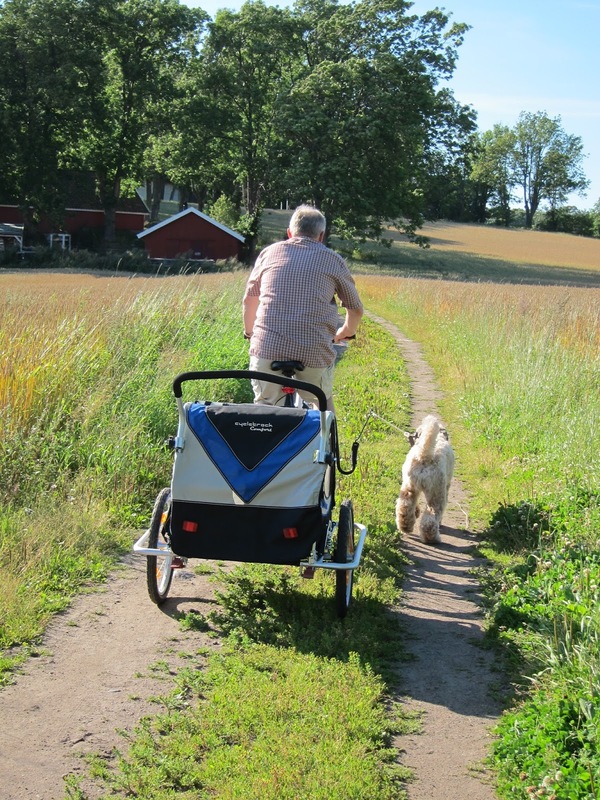 Yesterday as we rode our bicycles with Hector, the Wheaten Terrier, the sheaves of grain on the fields above the beach were golden, waiting for harvest and the time of reaping. The leaves on the trees are slowly changing into analogous shades of yellow, orange, and brown. The days are still warm and sunny. The night are crisp. That I can see this with my eyes, smell the scents, hear the birds, is all a wonder to me. A wonder I am thankful for. A few days ago Hector, the Wheaten Terrier and I brought two of the munchkins down this way. They wanted to find the sheep and horses. We played games along the way, sang songs, and wondered if we could see tigers, and lions, and bears, and more. Sienna, two years old, claimed she could smell elephants and her brother wondered if we could go see them. He remembered last year how we actually came upon an elephant and some camels in those same woods. A circus had settled down by the school and the large animals rested in the shade next to the path we walk on. That was a suprise! See previous blog entry here for that story. Exploring nature with little children is amazing. Large roots, easy to trip on, wound back and forth on the path. I explained that they were tree toes, an analogy easily picked up by curious little ones. Scott was amused by the thought that trees had such long toes. Going back the 3 years old big brother was tired. "I would like to sit in the stroller with Sienna," he said. "She can sit on my lap. I can handle it." He jumped into the stroller, we placed the little sister on his lap, and he gently put his arms around her. No complaints, just happy to sit with her up the last hill. Why am I witing all this? It portrays the things I treasure--family, home, nature--everyday blessings.